Baby Neopets don't have to worry about being left out of the Valentine's Day festivities because of these special wings. The Baby Valentine Wings can only be worn by Neopets who are painted Baby so even the youngest of Neopets can get in on the celebrations. The wings themselves feature a bunch of delicate pink hearts glued together and finished with a trim of fine white lace. 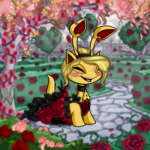 Is your Neopet mending a broken heart this Valentine's Day? If so then these wings are the right ones for them. What's more depressing than having a broken heart? Try having four because that's what these wings are. They're basically four broken purple hearts waiting for that special Neopet to come along and mend them. If that doesn't work then I've heard that Super Amazing Strong Glue can be just as effective and it's sold at your local School Supplies store. These wings are just like the ones Cupid himself wears! They're made of pure white feathers and are extremely lightweight so you know they're perfect for soaring through the skies. Neopets who are also not fans of the traditional Valentine's Day colours like pink and red can appreciate the pristine whiteness of these wings. When we think of Valentine's Day we think of the colour pink. These wings are the perfect representation of this holiday because the material they're made of is all pink and not just any shade of pink, but a bright and cheerful shade of the colour. Besides being all pink, these wings feature two giant hearts with three smaller hearts sprouting from the top. Can't you just feel the love growing? Unlike the previously mentioned wings, these wings aren't ones you would necessarily think of when you think Valentine's Day. Like the Cherub Wings, these wings are pure white except they aren't made with feathers. They're made of fine white lace which some might consider to be the traditional fabric for this holiday. 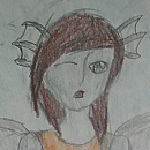 While wearing these wings your Neopet will still resemble Cupid, but they won't be confused as identical twins. OMG... How gorgeous are these wings? Not only are they pink, but they also have a shiny gold trim which only accentuates the craftsmanship of the different segments of the wings. Any Neopet would be lucky to be able to don on these swoon-worthy wings on Valentine's Day. For the tougher Neopets who want to get in on the Valentine's Day celebrations these wings might be the perfect choice for them. Not only are they pink and a very good representation of this day, but they also function as armour should your Neopet be challenged to a duel mid-flight. Aww, these wings are so soft and squishy and they would go well with any Neopet that is painted Plushie. The Plush Heart Wings also seem to have all the Valentine's Day basics covered. They're heart-shaped, covered with a floral design, finished with a delicate trim and wrapped with two pretty pink bows. The Red Feather Valentine Wings are very similar to the Cherub Wings I mentioned earlier. The major difference is that these wings are made with red feathers instead of white ones. If your Neopet's outfit could use a bit more colour, but you still want to stay with the feathered look then these are the wings for you. Like the Cherub Wings, these wings are extremely lightweight which makes soaring through the skies feel effortless. Roses are the official flower for Valentine's Day. Not only do they come in bouquet form, but TNT has also made them come in wing form. The Rose Petal Wings are the ultimate Valentine's Day accessory because it's like two accessories rolled into one. As an added bonus, they make any Neopet that's wearing them smell 10 times better! Did your Neopet like the look of the Gold Trimmed Valentines Wings, but found them too pink for their taste? If the answer is yes then the Royal Velvet Wings might be a good substitute. They're very similar in style to the Gold Trimmed Valentines Wings, but instead of the pink they come in a deep red colour finished off with a gold trim. Cupid is the messenger of love and now your Neopet can also be a messenger with these wings. These wings are lightweight so your Neopet will never feel weighed down while wearing them during the delivery of their Valentine's Day cards. Did I mention that they're super pink and adorned with two tiny red hearts?